Useful for aiding coagulation of blood and preventing proud flesh formation. It is a caustic agent, which contains copper sulphate, as well as activated charcoal and tannic acid, to aid wound healing. This is a firm favourite among horse owners with accident prone horses. 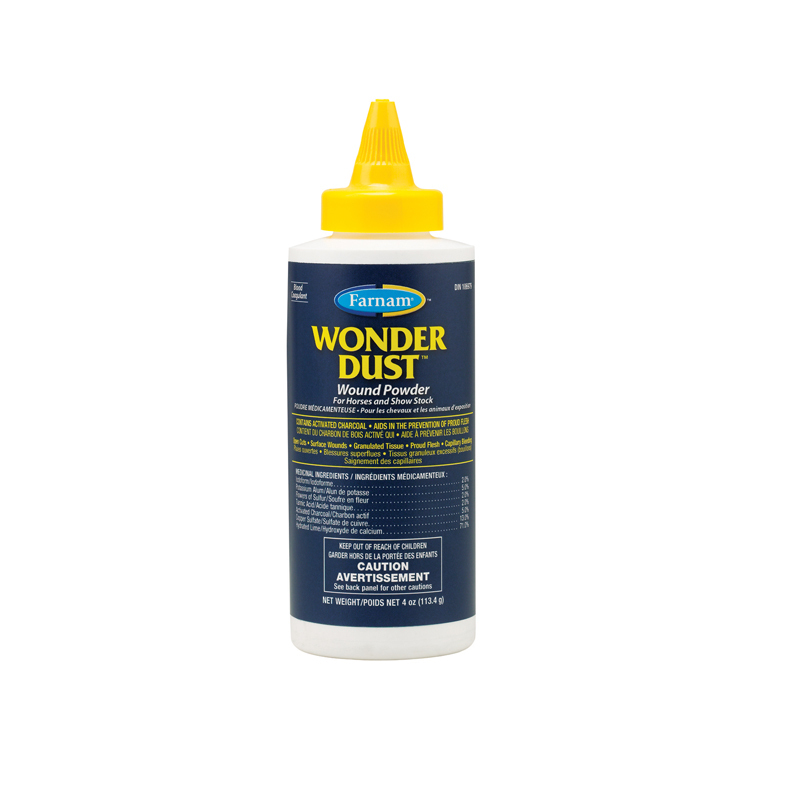 Wonder Dust can be used on fresh or chronic wounds but always make sure the wound is clean first. For new, bleeding wounds Wonder Dust can be applied to help stop the bleeding. It also contains an antiseptic (iodoform) to aid the cleanliness of the wound. Wonder Dust can also be used for wounds that are taking a while to heal. It contains copper sulphate which aids in the reduction of proud flesh. The addition of tannic acid and activated charcoal are useful for promoting healing after the copper sulphate has worked. Directions for Use: Secure the lid and then shake the bottle before use. Hold the bottle 2-4 inches away from the wound and squeeze the bottle to puff the powder over the affected area. Wonder Dust can be used with or without bandages.